We often do a great job cleaning the dirt and dust we can see, but there's a whole germy world out there we may forget to touch. Spring cleaning is a great way to give your home a much-needed detox, but sometimes, surfaces are ignored all year round. 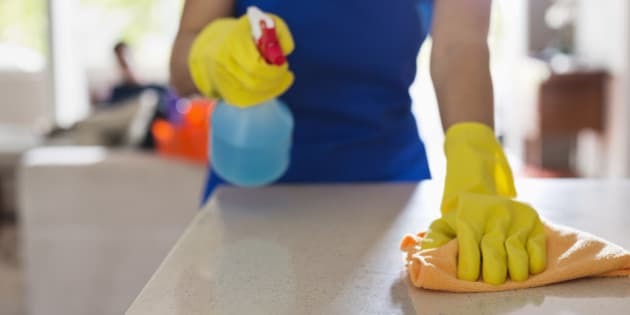 According to a recent survey on cleaning by caregiver website Care.com, 60 per cent of people revealed their biggest complaint about their home was, in fact, having to clean it. The survey found 63 per cent of women did most of the cleaning, along with a majority of the laundry, dishes and plant-tending. But since we're big fans of the idea that all housework should be shared equally, it may be a good idea for you and your partner to come up with a spring cleaning checklist together. Divide your home into sections and divide the tasks to figure out which rooms and surfaces need a full sweep, and which items are ready to be donated or thrown out. And while cleaning may seem like hard work, your body will thank you for it. Studies have shown things we use the most, like purses and door handles, are often the dirtiest and make us sick, according to ABC News.